Jemez Pueblo potter Pauline Romero has been producing pottery for more than 35 years. She was taught by her mother and grandmother Persingula R. Tosa and Lupe Romero. She begins by collecting the clay from the hills around Jemez Pueblo. She then cleans, mixes, hand coils, shapes, paints, polishes, and fires her pottery the traditional way, outdoors. She has a unique method of adding a hand stone polish to a red or buff colored slip. Usually, her pots are swirl bowls, wedding vases or other various shaped pots but she also has done etched work on her pottery that is a nice contrast to her polished work. Pauline has won 1st and 2nd place awards at Santa Fe Indian Market, New Mexico State Fair and Intertribal Indian Ceremonial. 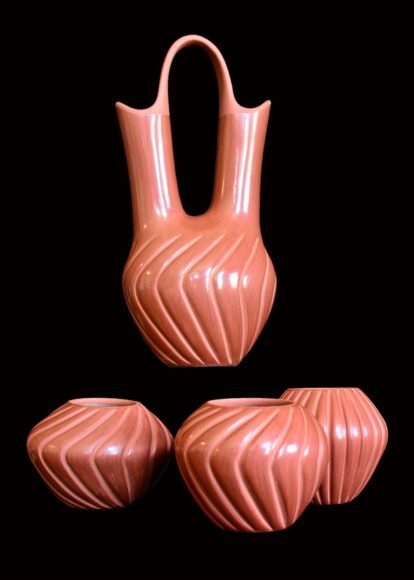 Her work is included in Gregory Schaaf’s ” Southern Pueblo Pottery: 2000 Artists Biograhies” , “Southwestern Pottery: Anasazi to Zuni” by Hayes and Bloom, “Pueblo and & Navajo Contemporary Pottery” by Berger and Schiffer and many other publications.